To Cite: Yaghchi S S, Fatemi M, Ghandehari F. Comparing the Effects of Saccharomyces boulardii and Selenium-Enriched S. boulardii on Hematological Parameters and Total Antioxidant Capacity in Aluminum Induced Toxicity in Rats, J Kermanshah Univ Med Sci. 2018 ; 22(3):e80282. doi: 10.5812/jkums.80282. Background: Oxidative stress induced by aluminum (Al) toxicity leads to the dysfunction of the hematopoietic system. Detoxifying by means of common chelators causes many side effects. Therefore, researchers have been trying to find safer treatments. Objectives: This study aimed to evaluate the effects of Saccharomyces boulardii and S. boulardii enriched with selenium (Se) on Al-induced toxicity in rats. Methods: Female rats were divided into 6 groups: (A) Control group, (B) S. boulardii treatment group, (C) enriched S. boulardii treatment group, (D) Al-infected group, (E) S. boulardii treated and Al-infected group, (F) enriched S. boulardii treated and Al-infected group. At the end of the treatment period, blood samples were taken directly from the hearts of rats in order to measure hematological parameters, total antioxidant capacity (T-AOC), malondialdehyde (MDA) concentrations, iron, and total iron binding capacity (TIBC). Results: Results revealed significant increases of white blood cells (WBC), red cell distribution width (RDW), TIBC and MDA in group D as compared to the control group and significant reductions of these factors in groups E and F as compared to group D. T-AOC, iron, and mean corpuscular volume (MCV) decreased in group D as compared to the control group, but significantly increased in groups E and F as compared to group D. Other observed changes were not statistically significant. Conclusions: It appears that S. boulardii partly reduced the harmful effects of Al toxicity, especially when enriched with Se due to its antioxidant properties. Further studies are needed in this area. Aluminum (Al) is the third element in the earth’s crust and the most abundant metal (after iron and calcium) widely distributed in the environment (1). This metal can be found in almost all food crops such as corn, yellow cheese, tea, salts, herbs, and spices. In addition, it is found in the mixture of a group of drugs and applied in drinking-water treatment (2). Thus, the entire population is largely exposed to it (1). Al causes a wide range of toxicity in the nervous, hematopoietic, skeletal, respiratory, and immune systems (3, 4). By non-controlled production of free oxygen radicals, Al leads to lipid peroxidation resulting in damage to cellular membranes and mitochondrial phospholipids (5). This metal consolidates superoxides by forming AlO2-, and facilitates biological oxidation with the formation of hydrogen peroxide Fe2+. Also, by producing superoxide anions via the Fenton reaction by converting Fe3+ to Fe2+, it changes antioxidant enzyme activities in the cells. So, Al cytotoxicity is known by its role in stimulating oxidative stress (6). Some chelators such as deferoxamine (DFO) and deferiprone (DFP) have been found to decrease Al levels in tissues and the oxidative stress caused by it; but these compounds create inevitable side effects like agranulocytosis, anorexia, and liver fibrosis (1). Today, the protective effects of natural products with antioxidant properties, such as ginger, saffron, and honey, have been investigated in aluminum toxicity (7), but few studies have been carried out on the effects of probiotics on aluminum toxicity. Probiotics are living microorganisms that exert their useful effects on the health of the host if consumed adequately. These microorganisms are a part of the normal flora of the digestive system. Lactobacillus, bifidobacteria, and a group of yeasts are considered the most important probiotics. Destroying pathogens, producing antimicrobial compounds, improving the intestinal microbial balance, enhancing lactose digestion, as well as absorbing minerals such as calcium and iron are the characteristic of probiotics (8-10). Probiotics are also beneficial for the human body because they produce vitamin-like compounds including B-vitamins (11). Some evidence has demonstrated that probiotics increase the intestine’s iron absorption ability by creating an acidic environment (10). Protection against oxidative stress and the ability to decrease the risk of accumulation of reactive oxygen metabolites have also been reported among the positive effects of probiotics (12). For example, the increased activity of a group of antioxidant enzymes, particularly superoxide dismutase, was observed in the liver and kidneys of cadmium-infected rats after consuming a dietary intake of Lactobacillus plantarum and Bacillus coagulans (13). In another similar research, the strengthening of the antioxidant system was seen in mercury-infected rats after taking these two probiotics (14). The antioxidant mechanism of probiotics could be related to free oxygen radicals scavenging, removal of metal ions, inhibition of oxidant compounds, and prevention of their production (12). Selenium (Se) is an essential trace element in the human diet showing the same antioxidant properties as probiotics. This metal micronutrient is the major constituent of selenoenzymes such as glutathione peroxidase (GPx3, GPx2), thioredoxin reductase, and selenoproteins P (15), which protect animal cells from oxidative damages (16). Se is available in both organic and inorganic forms. Studies have shown that the organic form of Se has higher absorption potentials and less toxicity than its inorganic form. Therefore, using bioseleniums such as selenomethionine, probiotics, and Se-enriched plants as dietary supplements have been considered (17). A study by El-Bayoumy and colleagues carried out on a group of adult men showed that consuming Se-enriched yeast not only improved testosterone secretions, but also significantly increased the level of reduced glutathione in their blood as compared to the control group, which indicated a decline of oxidative stress levels in their bodies (18). 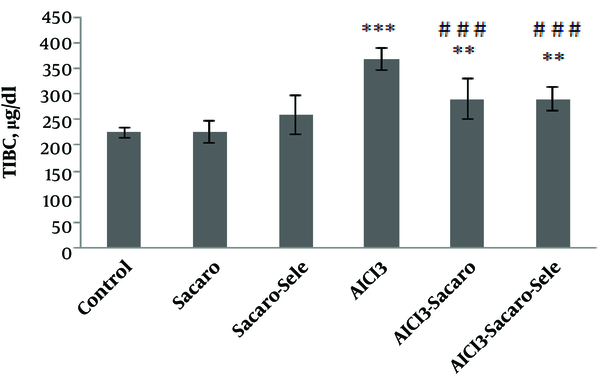 As the positive impacts of Se dietary supplements and probiotics in reducing oxidative stress levels by strengthening the antioxidant defense system have been specified (19), the present study investigated the likely impact of the Saccharomyces boulardii and S. boulardii enriched with Se against the AlCl3-induced toxicity in rats. A. Injection control group: 1 cc intradigestive injection of distilled water for 5 weeks (every other day) and intraperitoneal injection of 0.5 cc distilled water at the end of the third week. B. S. boulardii treatment group: 1 cc intradigestive injection of yeast suspension (1.5 × 108 CFU/mL) (20) for 5 weeks (every other day) and intraperitoneal injection of 0.5 cc distilled water at the end of the third week. C. Se-enriched S. boulardii treatment group (sodium selenite): 1 cc intradigestive injection of yeast suspension enriched with Se for 5 weeks (every other day) and intraperitoneal injection of 0.5 cc distilled water at the end of the third week. D. AlCl3-infected group: 1 cc intradigestive injection of distilled water for 5 weeks and intraperitoneal injection of 0.5 cc of AlCl3 at the end of the third week. E. S. boulardii treated and AlCl3 infected group: 1 cc intradigestive injection of yeast suspension (1.5 × 108 CFU/mL) for 5 weeks (every other day) and intraperitoneal injection of 0.5 cc of AlCl3 (4 mg/kg) (21) at the end of the third week. F. Se-enriched S. boulardii treated and AlCl3 infected group: 1 cc intradigestive injection of yeast suspension enriched with Se for 5 weeks (every other day) and intraperitoneal injection of 0.5 cc of AlCl3 at the end of the third week. In order to enrich the yeast with Se, 90 mL of sodium selenite (10 mg/mL) was added to 100 cc of suspension prepared from yeast and incubated for 48 hours at 37°C. After incubation in the 3000 rpm, it was centrifuged for 15 minutes and washed with sterile normal saline twice to remove excess selenium. Then, the Se-enriched yeast suspension (1.5 × 108 CFU/mL) was prepared from the resulting sediments (22). Finally, at the end of the treatment period, the rats were weighed and blood samples taken straight from their hearts. The number and index of blood cells (CBC) were measured using the cell counter device Mindray BC 6800 model. The amount of serum iron was calculated according to the instructions of Artiss and colleagues (23). The modified method of Goodwin and colleagues (24) and TIBC assay kit made by Pars Azmun Company were used to measure TIBC (total iron binding capacity). The blood’s total antioxidant capacity (T-AOC) was analyzed with the ELISA Reader method using the T-AOC assay kit of EASTBIOPHARM Company. Malondialdehyde (MDA) levels were evaluated using the thiobarbituric acid (TBA) method based on the detection of MDA-TBA levels at the wavelength of 532 nm according to the instructions of Qiao and colleagues (25). The data was analyzed as mean ± standard deviation using the SPSS-18 statistical software. According to Table 1, a significant increase in the number of white blood cells (WBC) was seen in the group exposed to AlCl3 as compared to the control group (P ≤ 0.05). Abbreviations: MCV, mean corpuscular volume; RDW, red cell distribution width; WBC, white blood cells. bThe asterisks indicate the significance levels of experimental groups as compared to the control group and # represents a comparison of the last two groups with the Al-infected group. Levels of significance values are *P ≤ 0.05, ***P ≤ 0.001, #P ≤ 0.05. WBC numbers decreased significantly (P ≤ 0.05) in both infected groups treated with S. boulardii and Se-enriched S. boulardii as compared to the Al-infected group. There were no significant differences in the platelet numbers between treatment groups as compared to the control group. Also, no significant differences were observed in the number of red blood cells, indices MCH and MCHC, hemoglobin concentrations, and hematocrit percentages among the groups; but, in the AlCl3-infected group, MCV (mean corpuscular volume) decreased significantly (P ≤ 0.001) and RDW (P ≤ 0.05) increased. These two parameters in both infected groups treated with S. boulardii and Se-enriched S. boulardii increased respectively (P ≤ 0.05) and decreased (P ≤ 0.05) as compared to the Al-infected group. As shown in Figure 1, iron concentrations in the AlCl3-infected group had a significant reduction (P ≤ 0.05), while it increased significantly in the S. boulardii and enriched S. boulardii treatment groups as compared to the control group (P ≤ 0.001). Figure 1. Comparison of serum iron concentrations between experimental groups. The results are expressed as mean ± SD. The asterisks indicate the significance levels of experimental groups as compared to the control group and # represents a comparison of the two last groups with the Al-infected group. Levels of significance values are *P ≤ 0.05, ***P ≤ 0.001, #P ≤ 0.05 ##P ≤ 0.01. Iron concentrations significantly increased in both infected groups treated with S. boulardii and Se-enriched S. boulardii (P ≤ 0.01 and P ≤ 0.05, respectively) as compared to the Al-infected group. 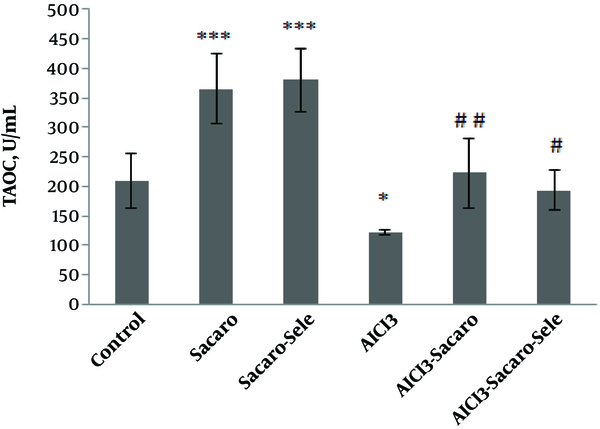 As shown in Figure 2, TIBC in the AlCl3-infected group, S. boulardii treated and AlCl3 infected group, and Se-enriched S. boulardii treated and AlCl3 infected group showed significant increases (P ≤ 0.001 and P ≤ 0.01, respectively). Figure 2. Comparison of serum TIBC concentrations between experimental groups. The results are expressed as mean ± SD. The asterisks indicate the significance levels of experimental groups as compared to the control group and # represents a comparison of the last two groups with the Al-infected group. Levels of significance values are **P ≤ 0.01, ***P ≤ 0.001, ###P ≤ 0.001. TIBC significantly declined (P ≤ 0.001) in both infected groups treated with S. boulardii and Se-enriched S. boulardii as compared to the Al-infected group. Also, as shown in Figure 3, T-AOC in the AlCl3-infected group, S. boulardii treated and AlCl3 infected group, and Se-enriched S. boulardii treated and AlCl3 infected group significantly declined as compared to the control group (P ≤ 0.001, P ≤ 0.01 and P ≤ 0.05, respectively). Figure 3. 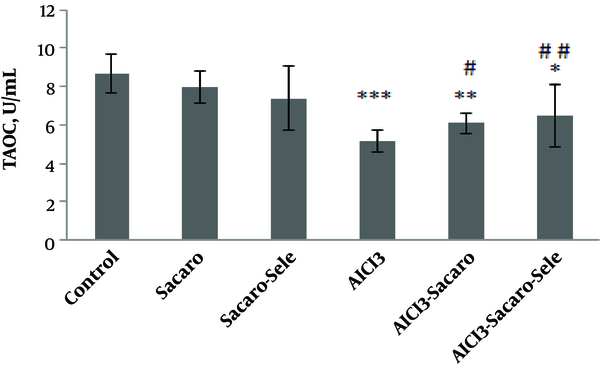 Comparison of serum T-AOC concentrations between experimental groups. The results are expressed as mean ± SD. The asterisks indicate the significance levels of experimental groups as compared to the control group and # represents a comparison of the last two groups with the Al-infected group. Levels of significance values are *P ≤ 0.05, **P ≤ 0.01, ***P ≤ 0.001, #P ≤ 0.05 ##P ≤ 0.01. Significant increases of this parameter were seen in both infected groups treated with S. boulardii and Se-enriched S. boulardii as compared to the Al-infected group (P ≤ 0.05 and P ≤ 0.01, respectively). As shown in Figure 4, MDA in both the AlCl3-infected group and AlCl3 infected group treated with S. boulardii increased significantly as compared to the control group (P ≤ 0.001 and P ≤ 0.05, respectively). Figure 4. Comparison of serum MDA concentrations between experimental groups. The results are expressed as mean ± SD. The asterisks indicate the significance levels of experimental groups as compared to the control group and # represents a comparison of the last two groups with the Al-infected group. Levels of significance values are *P ≤ 0.05, ***P ≤ 0.001, #P ≤ 0.05 ##P ≤ 0.01. Malondialdehyde levels decreased in both infected groups treated with S. boulardii and Se-enriched S. boulardii as compared to the Al-infected group (P ≤ 0.05 and P ≤ 0.01, respectively). In the present research, the average number of platelets, RBC and its indices (MCH, MCHC), hemoglobin concentrations, and hematocrit percentages did not show any significant changes in the experimental groups as compared to the controls; whereas, the MCV (mean corpuscular volume) and RDW (red cell distribution width) in the Al infected group have shown significant decreases and increases, respectively. Changes in these two factors are directly related to the type of anemia. MCV reductions and RDW increases can be seen in heterogeneous microcytic anemia, which includes iron deficiency, S β-thalassemia, hemoglobin H, and red cell fragmentation (26). In a research conducted by Jacob and colleagues, increased blood lead levels apart from a slight increase in RBC led to reductions in some blood parameters such as MCV, especially in the girls (27). Bakour and colleagues reported significant reductions of MCV because of Al exposure (7). In the present study, MCV reductions in AlCl3-infected groups suggest that Al likely caused anemia. RDW changes above normal levels may indicate liver disease, anemia, and nutritional deficiencies. This parameter will increase in all types of anemia, including iron deficiency anemia; when its rates go up it implies anisocytosis (28). RDW rises in the AlCl3 exposed group increases the risk of anemia caused by Al. In both AlCl3-infected groups treated with S. boulardii and enriched S. boulardii, significant increases of MCV and decreases of RDW were found as compared to those in the AlCl3-infected group. We suggested that S. boulardii and enriched S. boulardii probably prevented anemia resulting from Al infection. Continuing our study, iron and TIBC levels were also compared among the experimental groups due to the formation risk of iron deficiency anemia. Iron concentrations decreased significantly in the AlCl3-infected group while it increased significantly in both S. boulardii and enriched S. boulardii treatment groups. Caramelo and colleagues declared that microcytic anemia caused by Al in dialysis patients with long-term treatment that microcytosis created by the Al was due to insufficient iron in most cases (29). In a study by Chmielnicka and colleagues, normocytic anemia was observed in mice poisoned with aluminum chloride. They found a direct relationship between the dose of metal and serum iron concentrations, blood parameters, and changes in the activity of enzymes involved in heme biosynthesis (21). Mahieu and colleagues (30), and Farina and colleagues (31), reported lower levels of serum iron in separate studies due to Al exposure. A reduction in serum iron levels due to Al exposure can be attributed to the effects of Al on iron movement at various levels, poor absorption of iron in the intestine, and interference in iron cellular absorption (29). Significant increases in iron concentrations in both treatment groups probably reflect the ability of S. boulardii and Se-enriched S. boulardii to produce vitamin B12 with probiotics (11) or an increased intestinal absorption of iron (10). Serum iron levels in both infected groups treated with S. boulardii and enriched S. boulardii as compared to the AlCl3-infected group showed significant increases. Increased serum iron levels under the influence of S. boulardii, especially when enriched with Se, could have had a compensatory effect on serum iron reductions caused by Al. Based on some available evidence, probiotics can promote iron absorption by creating an acid environment, convert ferric iron to ferrous iron, reduce phytase levels, as well as produce a variety of B vitamins, including vitamin B12 (32, 33). This is why a group of researchers has recommended the daily consumption of probiotic-containing diets for anemic people (10, 34). Furthermore, despite insufficient studies on the impacts of Se-enriched yeast on anemia, it was clearly demonstrated that due to the performance of selenoproteins, Se causes a reduction of reactive oxygen species (ROS) levels indirectly and prevents the hemolysis of erythrocytes membrane lipids and proteins. Thus by maintaining the survival of these cells it prevents anemia (35). TIBC, or total iron binding capacity, shows the maximum amount of iron that can be connected to transferrin. Increased TIBC is a symptom of iron deficiency anemia (36). TIBC concentrations increased in the AlCl3-infected group as compared to the control group. Significant TIBC increases along with serum iron decreases in the AlCl3-infected group confirm the risk of iron deficiency anemia in this group. Although there were significant increases in TIBC in both AlCl3-infected groups treated with either S. boulardii or with Se-enriched S.boulardii, this increase was lower than that in the AlCl3-infected group. Therefore, highly significant decreases in this factor were observed in both groups by comparing their TIBC levels with that of the AlCl3-infected group. So, it can be concluded that both S. boulardii and enriched S. boulardii prevented the adverse effects of Al on serum iron surfaces to some extent but not completely. In the present research, WBC increased significantly in the AlCl3-infected group; however, it showed no significant differences in other experimental groups as compared to the control group. In line with our results, Kalaiselvi and colleagues showed that long exposures to Al could result in an increase in the number of WBC as compared to the control group (37). This suggested that WBC increases may be either associated to immune responses or protective reactions against oxidative stress induced by Al. In fact, lymphopoiesis stimulation or abundant releases of lymphocytes from lymphomyeloid tissues under the stress of toxicity may result in an increase in WBC. Mugahi and colleagues had observed leukocytosis after lead infection in rats and reported that it was due to increased numbers of lymphocytes, neutrophils, and monocytes (38). Morsy and colleagues also found significant increases in white blood cells after the exposure of rats to aluminum oxide (AL2O3) (39). It seems that increases in WBC are caused either by an inflammation in the body or the induction of oxidative stress by AlCl3. A close connection exists between inflammation formation and induction of oxidative stress in the body-that is via immune system stimulation upon the entrance of foreign agents into the body; immune cells mobilize and secrete various inflammatory cytokines such as interleukin-6 and the tumor necrosis factor, which in turn leads to ROS release and then oxidative stress induction in the body (40, 41). So, in this study, reduced amounts of white blood cells in both Al-infected groups treated with S. boulardii and enriched S. boulardii as compared to the infected group that was not treated can indicate the beneficial effects of this probiotic, especially in Se-enriched form, on modulating the host immune system function because of its antioxidant function. Yu and colleagues reported that Lactobacillus plantarum CCFM639 exerts its protective effects on inflammation and Al-induced oxidative stress by preventing the activities of oxygen free radicals and inflammatory cytokines, including tumor necrosis factor alpha (TNF-α), interleukin-1β (IL-1β), and interleukin-6 (IL-6), reducing MDA levels, and increasing the activities of SOD and CAT (42). A group of researchers has shown that both probiotics and Se are able to prevent the induction of oxidative stress by eliminating oxygen free radicals and metal ions, and also protect the body against the adverse effects of heavy metals with their antioxidant properties (12, 43, 44). It was mentioned earlier that oxidative stress induction is the symptom of heavy metals toxicity. Therefore, the T-AOC and MDA levels were compared between groups. In the AlCl3-infected group, significant reductions in the T-AOC levels and significant increases in MDA concentrations were observed which could be due to the oxidative stress induced by Al. In line with this consistency, in their research Sargazi and colleagues attributed kidney damage and increased MDA levels in Al toxicity to non-controlled production of free oxygen radicals in the cells and tissues (5). In another study, lipid peroxidation as well as reduced glutathione levels and activities were observed in the renal tissues of rats after long exposures to aluminum lactate (45). Increased levels of MDA caused by Al toxicity has been proved in other research (25, 46, 47). This is consistent with the results of the present study and confirms the induction of oxidative stress because MDA is a marker for lipid peroxidation measurement and oxidative stress evaluation (1). A team of researchers believes that Al generates large amounts of free oxygen radicals in processes like the Haber and Fenton processes, which in turn cause oxidative damages to the tissues and weaken the body’s antioxidant defense system by increasing the oxidation of important biomolecules and peroxidation of cell membranes (48-50). In the present study, although decreased T-AOC and increased MDA levels were observed in both AlCl3-infected groups treated with S. boulardii or enriched S. boulardii, these changes were not as large as those of the AlCl3-infected group. As compared to the Al-infected group in both S. boulardii and enriched S. boulardii treatment groups, MDA and T-AOC levels significantly decreased and increased, respectively. However, these changes were more significant in the S. boulardii treatment group. It seems that S. boulardii and selenium synergistically declined oxidative stress levels due to their antioxidant functions, but their impact was not strong enough to thoroughly overcome the induction of oxidative stress caused by Al toxicity. Probiotics are able to scavenge free oxygen radicals, remove metal ions, inhibit oxidant compounds and prevent their production (12). Yu and colleagues reported that the antioxidant properties of probiotics, including Lactobacillus plantarum, could reduce oxidative stress caused by Al and thereby reduce its toxicity (1). In another study, by inhibiting oxidative stress through reducing free oxygen radicals and lipid peroxidation, Se supplements led to the reduction of kidney damage in rats which had been exposed to gentamicin (43). Ghorbel and colleagues reported in their study that Se supplements were not only able to reduce oxidative stress levels by restoring the antioxidant status in AlCl3-exposed mice, but they were also effective in the prevention of liver damage because of their antioxidant properties (19). In a similar study, El-Demerdash observed reduced levels of free radicals and cholesterol in addition to increased amounts of glutathione-S-transferase and total protein after taking selenium supplements in order to deal with Al toxicity (51). Studies on the positive effects of Se-enriched probiotics as compared to probiotics alone are limited; but according to facts, both probiotic and selenium have antioxidant properties. It seems that a combination of these two factors had synergic effects on dealing with Al toxicity as compared to the consumption of probiotics alone. This was also proved in a comparative study by Shi and colleagues who showed that using organic Se supplements (yeast enriched with Se) in the diet of pregnant Taihang black goats had been more effective on their antioxidant status, hormonal secretions, and hematobiochemical parameters than consuming its mineral supplements (52). According to conducted research, Se-enriched yeast possesses characteristics similar to those of selenomethionine which is essential for the body, but is not made by the body and must be supplied in dietary sources (53, 54). So, Se-enriched yeast can be used as a precursor for the synthesis of selenoproteins that are antioxidant enzymes and prevent cellular damages caused by the activities of free radicals (55). Obtained results in this study indicated that due to its antioxidant properties and potential intestinal iron absorptions, S. boulardii prevents the decline of serum iron concentrations and oxidative stress induction caused by Al toxicity to some extent. Since Se is an essential element for the proper function of some antioxidant enzymes, using it with this probiotic may have had synergistic effects on the results. However, more studies, including increased treatment durations, doses, and analysis of other oxidative and anti-oxidative factors are needed to confirm the results. Funding/Support: This study was supported with the grant given by the Islamic Azad University, Falavarjan Branch. 1. Yu L, Zhai Q, Liu X, Wang G, Zhang Q, Zhao J, et al. Lactobacillus plantarum CCFM639 alleviates aluminium toxicity. Appl Microbiol Biotechnol. 2016;100(4):1891-900. doi: 10.1007/s00253-015-7135-7. [PubMed: 26610803]. 2. Al-Eisa RA, Al-Nahari HA. The attenuating effect of royal jelly on hormonal parameters in aluminum chloride (AlCl3) intoxicated rats. Int J Pharm Res Allied Sci. 2017;6(2):70-85. 3. Liu J, Wang Q, Sun X, Yang X, Zhuang C, Xu F, et al. The toxicity of aluminum chloride on kidney of rats. Biol Trace Elem Res. 2016;173(2):339-44. doi: 10.1007/s12011-016-0648-9. [PubMed: 26910335]. 4. Xu F, Liu Y, Zhao H, Yu K, Song M, Zhu Y, et al. Aluminum chloride caused liver dysfunction and mitochondrial energy metabolism disorder in rat. J Inorg Biochem. 2017;174:55-62. doi: 10.1016/j.jinorgbio.2017.04.016. [PubMed: 28605655]. 5. Sargazi M, Shenkin A, Roberts NB. Aluminium-induced injury to kidney proximal tubular cells: Effects on markers of oxidative damage. J Trace Elem Med Biol. 2006;19(4):267-73. doi: 10.1016/j.jtemb.2005.11.002. [PubMed: 16443175]. 6. Lin CY, Hsiao WC, Huang CJ, Kao CF, Hsu GS. Heme oxygenase-1 induction by the ROS-JNK pathway plays a role in aluminum-induced anemia. J Inorg Biochem. 2013;128:221-8. doi: 10.1016/j.jinorgbio.2013.07.026. [PubMed: 23969109]. 7. Bakour M, Al-Waili NS, El Menyiy N, Imtara H, Figuira AC, Al-Waili T, et al. Antioxidant activity and protective effect of bee bread (honey and pollen) in aluminum-induced anemia, elevation of inflammatory makers and hepato-renal toxicity. J Food Sci Technol. 2017;54(13):4205-12. doi: 10.1007/s13197-017-2889-9. [PubMed: 29184226]. [PubMed Central: PMC5686000]. 8. Ranganathan N, Ranganathan P, Friedman EA, Joseph A, Delano B, Goldfarb DS, et al. Pilot study of probiotic dietary supplementation for promoting healthy kidney function in patients with chronic kidney disease. Adv Ther. 2010;27(9):634-47. doi: 10.1007/s12325-010-0059-9. [PubMed: 20721651]. 9. Natarajan R, Pechenyak B, Vyas U, Ranganathan P, Weinberg A, Liang P, et al. Randomized controlled trial of strain-specific probiotic formulation (Renadyl) in dialysis patients. Biomed Res Int. 2014;2014:568571. doi: 10.1155/2014/568571. [PubMed: 25147806]. [PubMed Central: PMC4132402]. 10. Korcok DJ, Trsic-Milanovic NA, Ivanovic ND, Dordevic BI. Development of probiotic formulation for the treatment of iron deficiency anemia. Chem Pharm Bull (Tokyo). 2018;66(4):347-52. doi: 10.1248/cpb.c17-00634. [PubMed: 29353864]. 11. LeBlanc JG, Milani C, de Giori GS, Sesma F, van Sinderen D, Ventura M. Bacteria as vitamin suppliers to their host: A gut microbiota perspective. Curr Opin Biotechnol. 2013;24(2):160-8. doi: 10.1016/j.copbio.2012.08.005. [PubMed: 22940212]. 12. Amaretti A, di Nunzio M, Pompei A, Raimondi S, Rossi M, Bordoni A. Antioxidant properties of potentially probiotic bacteria: In vitro and in vivo activities. Appl Microbiol Biotechnol. 2013;97(2):809-17. doi: 10.1007/s00253-012-4241-7. [PubMed: 22790540]. 13. Jafarpour D, Shekarforoush SS, Ghaisari HR, Nazifi S, Sajedianfard J, Eskandari MH. Protective effects of synbiotic diets of Bacillus coagulans, Lactobacillus plantarum and inulin against acute cadmium toxicity in rats. BMC Complement Altern Med. 2017;17(1):291. doi: 10.1186/s12906-017-1803-3. [PubMed: 28583137]. [PubMed Central: PMC5460540]. 14. Majlesi M, Shekarforoush SS, Ghaisari HR, Nazifi S, Sajedianfard J, Eskandari MH. Effect of probiotic bacillus coagulans and lactobacillus plantarum on alleviation of mercury toxicity in rat. Probiotics Antimicrob Proteins. 2017;9(3):300-9. doi: 10.1007/s12602-016-9250-x. [PubMed: 28084611]. 15. Salmani Nodoushan MH, Abedi M, Vakilli M. [Selenium and human health]. J Shahid Sadoughi Univ Med Sci. 2013;21(1):101-12. Persian. 16. Forootanfar H, Adeli-Sardou M, Nikkhoo M, Mehrabani M, Amir-Heidari B, Shahverdi AR, et al. Antioxidant and cytotoxic effect of biologically synthesized selenium nanoparticles in comparison to selenium dioxide. J Trace Elem Med Biol. 2014;28(1):75-9. doi: 10.1016/j.jtemb.2013.07.005. [PubMed: 24074651]. 17. Wang X, Yang Y, Zhang H, Liu J. Safety assessment and comparison of sodium selenite and bioselenium obtained from yeast in mice. Biomed Res Int. 2017;2017:3980972. doi: 10.1155/2017/3980972. [PubMed: 29214165]. [PubMed Central: PMC5682906]. 18. El-Bayoumy K, Richie JP Jr, Boyiri T, Komninou D, Prokopczyk B, Trushin N, et al. Influence of selenium-enriched yeast supplementation on biomarkers of oxidative damage and hormone status in healthy adult males: A clinical pilot study. Cancer Epidemiol Biomarkers Prev. 2002;11(11):1459-65. [PubMed: 12433727]. 19. Ghorbel I, Elwej A, Chaabane M, Jamoussi K, Mnif H, Boudawara T, et al. Selenium alleviates oxidative stress and lung damage induced by aluminum chloride in adult rats: Biochemical and histological approach. Biol Trace Elem Res. 2017;176(1):181-91. doi: 10.1007/s12011-016-0818-9. [PubMed: 27550156]. 20. 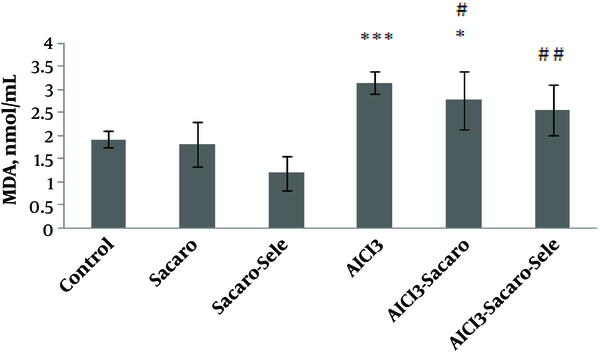 Rodrigues AC, Nardi RM, Bambirra EA, Vieira EC, Nicoli JR. Effect of Saccharomyces boulardii against experimental oral infection with Salmonella typhimurium and Shigella flexneri in conventional and gnotobiotic mice. J Appl Bacteriol. 1996;81(3):251-6. doi: 10.1111/j.1365-2672.1996.tb04325.x. [PubMed: 8810053]. 21. Chmielnicka J, Nasiadek M, Lewandowska-Zyndul E, Pinkowski R. Effect of aluminum on hematopoiesis after intraperitoneal exposure in rats. Ecotoxicol Environ Saf. 1996;33(3):201-6. doi: 10.1006/eesa.1996.0026. [PubMed: 8727512]. 22. Chen L, Pan DD, Zhou J, Jiang YZ. Protective effect of selenium-enriched Lactobacillus on CCl4-induced liver injury in mice and its possible mechanisms. World J Gastroenterol. 2005;11(37):5795-800. doi: 10.3748/wjg.v11.i37.5795. [PubMed: 16270387]. [PubMed Central: PMC4479678]. 23. Artiss JD, Vinogradov S, Zak B. Spectrophotometric study of several sensitive reagents for serum iron. Clin Biochem. 1981;14(6):311-5. doi: 10.1016/S0009-9120(81)91065-1. [PubMed: 7333008]. 24. Goodwin JF, Murphy B, Guillemette M. Direct measurement of serum iron and binding capacity. Clin Chem. 1966;12(2):47-57. [PubMed: 4952421]. 25. Qiao M, Liu P, Ren X, Feng T, Zhang Z. Potential protection of taurine on antioxidant system and ATPase in brain and blood of rats exposed to aluminum. Biotechnol Lett. 2015;37(8):1579-84. doi: 10.1007/s10529-015-1846-9. [PubMed: 25967032]. 26. Bessman JD, Gilmer PR Jr, Gardner FH. Improved classification of anemias by MCV and RDW. Am J Clin Pathol. 1983;80(3):322-6. [PubMed: 6881096]. 27. Jacob B, Ritz B, Heinrich J, Hoelscher B, Wichmann HE. The effect of low-level blood lead on hematologic parameters in children. Environ Res. 2000;82(2):150-9. doi: 10.1006/enrs.1999.4011. [PubMed: 10662529]. 28. Constantino BT. Red cell distribution width, revisited. Lab Med. 2013;44(2):e2-9. doi: 10.1309/lmz1gky9lqtvfbl7. 29. Caramelo CA, Cannata JB, Rodeles MR, Fernandez Martin JL, Mosquera JR, Monzu B, et al. Mechanisms of aluminum-induced microcytosis: Lessons from accidental aluminum intoxication. Kidney Int. 1995;47(1):164-8. doi: 10.1038/ki.1995.19. [PubMed: 7731142]. 30. Mahieu S, del Carmen Contini M, Gonzalez M, Millen N, Elias MM. Aluminum toxicity. Hematological effects. Toxicol Lett. 2000;111(3):235-42. doi: 10.1016/S0378-4274(99)00184-8. [PubMed: 10643868]. 31. Farina M, Rotta LN, Soares FA, Jardim F, Jacques R, Souza DO, et al. Hematological changes in rats chronically exposed to oral aluminum. Toxicology. 2005;209(1):29-37. doi: 10.1016/j.tox.2004.12.005. [PubMed: 15725511]. 32. Bergqvist SW, Andlid T, Sandberg AS. Lactic acid fermentation stimulated iron absorption by Caco-2 cells is associated with increased soluble iron content in carrot juice. Br J Nutr. 2006;96(4):705-11. [PubMed: 17010230]. 33. Bering S, Suchdev S, Sjoltov L, Berggren A, Tetens I, Bukhave K. A lactic acid-fermented oat gruel increases non-haem iron absorption from a phytate-rich meal in healthy women of childbearing age. Br J Nutr. 2006;96(1):80-5. doi: 10.1079/BJN20061683. [PubMed: 16869994]. 34. Hoppe M, Onning G, Berggren A, Hulthen L. Probiotic strain Lactobacillus plantarum 299v increases iron absorption from an iron-supplemented fruit drink: A double-isotope cross-over single-blind study in women of reproductive age. Br J Nutr. 2015;114(8):1195-202. doi: 10.1017/S000711451500241X. [PubMed: 26428277]. [PubMed Central: PMC4594053]. 35. Kaur R, Ghanghas P, Rastogi P, Kaushal N. Protective role of selenium against hemolytic anemia is mediated through redox modulation. Biol Trace Elem Res. 2018. doi: 10.1007/s12011-018-1483-y. [PubMed: 30151563]. 36. Tari K, Shamsi Z, Rahimi A, Atashi A. Relationship between serum ferritin, TIBC level and Helicobacter pylori infection. Zahedan J Res Med Sci. 2016;18(8). e7935. doi: 10.17795/zjrms-7935. 37. Kalaiselvi A, Aadhinaath Reddy G, Ramalingam V. Effect of aluminum chloride and protective effect of Ginger extract on hematological profiles in male wistar rats. Int J Pharm Phytopharmacol Res. 2015;4(4):218-22. 38. Mugahi MH, Heidari Z, Mahmoudzadeh Sagheb H, Barbarestani M. Effects of chronic lead acetate intoxication on blood indices of male adult rat. Daru J Pharm Sci. 2003;11(4):147-51. 39. Morsy GM, El-Ala KS, Ali AA. Studies on fate and toxicity of nanoalumina in male albino rats: Some haematological, biochemical and histological aspects. Toxicol Ind Health. 2016;32(4):634-55. doi: 10.1177/0748233713504022. [PubMed: 24215066]. 40. Donath MY. Targeting inflammation in the treatment of type 2 diabetes. Diabetes Obes Metab. 2013;15 Suppl 3:193-6. doi: 10.1111/dom.12172. [PubMed: 24003937]. 41. Gratas-Delamarche A, Derbre F, Vincent S, Cillard J. Physical inactivity, insulin resistance, and the oxidative-inflammatory loop. Free Radic Res. 2014;48(1):93-108. doi: 10.3109/10715762.2013.847528. [PubMed: 24060092]. 42. Yu L, Zhai Q, Tian F, Liu X, Wang G, Zhao J, et al. Potential of Lactobacillus plantarum CCFM639 in protecting against aluminum toxicity mediated by intestinal barrier function and oxidative stress. Nutrients. 2016;8(12). doi: 10.3390/nu8120783. [PubMed: 27918411]. [PubMed Central: PMC5188438]. 43. Randjelovic P, Veljkovic S, Stojiljkovic N, Velickovic L, Sokolovic D, Stoiljkovic M, et al. Protective effect of selenium on gentamicin-induced oxidative stress and nephrotoxicity in rats. Drug Chem Toxicol. 2012;35(2):141-8. doi: 10.3109/01480545.2011.589446. [PubMed: 22091876]. 44. Deepmala J, Deepak M, Srivastav S, Sangeeta S, Kumar SA, Kumar SS. Protective effect of combined therapy with dithiothreitol, zinc and selenium protects acute mercury induced oxidative injury in rats. J Trace Elem Med Biol. 2013;27(3):249-56. doi: 10.1016/j.jtemb.2012.12.003. [PubMed: 23428462]. 45. Mahieu S, Millen N, Gonzalez M, Contini Mdel C, Elias MM. Alterations of the renal function and oxidative stress in renal tissue from rats chronically treated with aluminium during the initial phase of hepatic regeneration. J Inorg Biochem. 2005;99(9):1858-64. doi: 10.1016/j.jinorgbio.2005.06.023. [PubMed: 16129492]. 46. Cheraghi E, Golkar A, Roshanaei K, Alani B. Aluminium-induced oxidative stress, apoptosis and alterations in testicular tissue and sperm quality in wistar rats: Ameliorative effects of curcumin. Int J Fertil Steril. 2017;11(3):166-75. doi: 10.22074/ijfs.2017.4859. [PubMed: 28868838]. [PubMed Central: PMC5582144]. 47. Ige SF, Adeniyi MJ, Iyalla GO. Allium cepa mitigates aluminum chloride-induced hepatotoxicity in male wistar rats. J Biomedical Sci. 2017;6(4):27. 48. Mahdi AA, Tripathi S, Neerja J, Hasan M. Aluminium mediated oxidative stress: Possible relationship to cognitive impairment of Alzheimer's type. Ann Neurosci. 2006;13(1):18-24. doi: 10.5214/ans.0972.7531.2006.130104. 49. Iglesias-Gonzalez J, Sanchez-Iglesias S, Beiras-Iglesias A, Mendez-Alvarez E, Soto-Otero R. Effects of aluminium on rat brain mitochondria bioenergetics: An in vitro and in vivo study. Mol Neurobiol. 2017;54(1):563-70. doi: 10.1007/s12035-015-9650-z. [PubMed: 26742531]. 50. Martinez CS, Alterman CD, Pecanha FM, Vassallo DV, Mello-Carpes PB, Miguel M, et al. Aluminum exposure at human dietary levels for 60 days reaches a threshold sufficient to promote memory impairment in rats. Neurotox Res. 2017;31(1):20-30. doi: 10.1007/s12640-016-9656-y. [PubMed: 27473855]. 51. El-Demerdash FM. Antioxidant effect of vitamin E and selenium on lipid peroxidation, enzyme activities and biochemical parameters in rats exposed to aluminium. J Trace Elem Med Biol. 2004;18(1):113-21. doi: 10.1016/j.jtemb.2004.04.001. [PubMed: 15487771]. 52. Shi L, Ren Y, Zhang C, Yue W, Lei F. Effects of organic selenium (Se-enriched yeast) supplementation in gestation diet on antioxidant status, hormone profile and haemato-biochemical parameters in Taihang Black Goats. Anim Feed Sci Technol. 2018;238:57-65. doi: 10.1016/j.anifeedsci.2018.02.004. 53. Chasteen TG, Bentley R. Biomethylation of selenium and tellurium: Microorganisms and plants. Chem Rev. 2003;103(1):1-25. doi: 10.1021/cr010210+. [PubMed: 12517179]. 54. Steinbrenner H, Al-Quraishy S, Dkhil MA, Wunderlich F, Sies H. Dietary selenium in adjuvant therapy of viral and bacterial infections. Adv Nutr. 2015;6(1):73-82. doi: 10.3945/an.114.007575. [PubMed: 25593145]. [PubMed Central: PMC4288282]. 55. Yu SY, Zhu YJ, Li WG. Protective role of selenium against hepatitis B virus and primary liver cancer in Qidong. Biol Trace Elem Res. 1997;56(1):117-24. doi: 10.1007/BF02778987. [PubMed: 9152515].